Some forms of medical treatment, particularly chemotherapy and radiotherapy, can have an adverse effect on fertility in women. This generally occurs as a result of a toxic effect on the ovary leading to permanent death of the oocytes (or eggs) in the ovary. Why is the ovary affected? When girls are born, they have all the oocytes that they will ever have and they continue to use them up through the rest of their life. Unlike men who continually make sperm throughout their lifetime, women cannot make any new oocytes. Therefore, any oocytes that are lost or damaged through medical treatment can never be replaced. How many oocytes are there in the ovary? Immature oocytes (primordial oocytes). There are many thousands of these stored within the ovary waiting to be released. A reliable and safe method of maturing these oocytes is still being researched. However, immature oocytes can be satisfactorily frozen in the tissue in case of any future developments. Developing oocytes. There are approximately 5 to 20 of these in the ovaries at any one time. These oocytes are partially mature and if removed from the ovary at this stage may be matured by culture in the laboratory for several days. 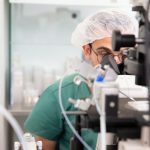 This process of partial ‘in vitro maturation’ has been successful in producing mature oocytes, which will fertilise in the laboratory and these fertilised oocytes have resulted in successful pregnancies in a small number of women. However, these matured oocytes cannot be easily frozen. Mature oocytes. The ovary naturally produces only 1 (or occasionally 2) mature oocytes in the middle of each menstrual cycle. This is all that is usually required for pregnancy. In theory, this mature oocyte could be collected for storage just before ovulation. However, this would provide only a very tiny chance of a future pregnancy and is generally regarded as insufficient to make single oocyte collection and storage worthwhile. Hormone treatment given by daily injection for about 12 days can be used to allow several oocytes to become mature for collection at one time. This is a usual part of in vitro fertilisation (IVF) treatment. 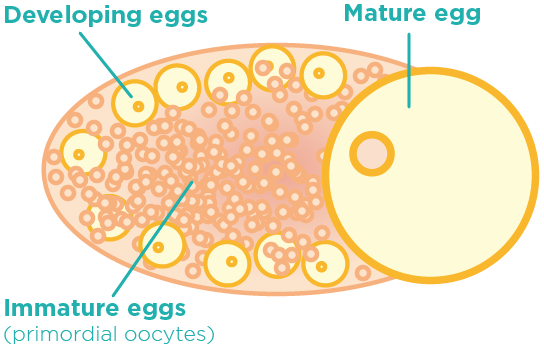 Mature oocytes can be fertilised and the fertilised egg (embryo) can be frozen and stored. 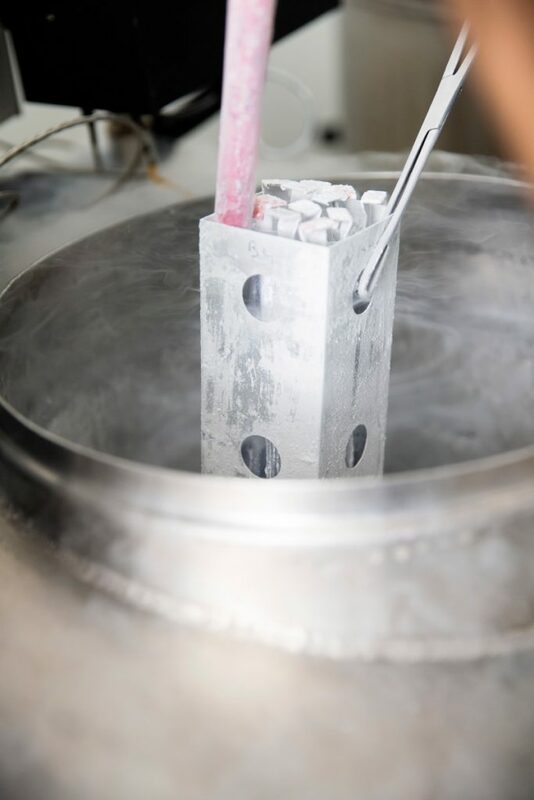 Mature oocytes can also be frozen and later thawed before fertilisation in the laboratory. What can be done to give me a chance of fertility? Chemotherapy and radiotherapy treatment can harm all 3 of these oocyte types and therefore may cause irreversible fertility. At present, there is unfortunately no proven way to protect the ovaries against the effects of these treatments. 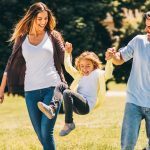 The only treatment that is currently readily available and which offers a reasonable chance of future pregnancy is to undertake in vitro fertilisation and store the fertilised embryos that are produced. It’s important to remember that this form of treatment will give you a chance of success but quite clearly cannot guarantee pregnancy. The IVF procedure takes approximately 2 weeks to complete. Therefore you need to be able to safely delay chemotherapy or radiotherapy treatment for 2 weeks. Your oncologist will work alongside your fertility specialist to advise you if this is possible. Unfortunately, for some forms of cancer treatment delay or ovarian stimulation with hormones is not advisable for your overall health. If your fertility has already been compromised by chemotherapy or radiotherapy treatment, you may be able to achieve a pregnancy if another woman donates her oocytes to you. The donor would have to go through an IVF treatment cycle to have her oocytes collected. The collected oocytes would be fertilised with your partner or donor’s sperm and the embryos transferred to you at an appropriate time. Complete oocyte maturation in the laboratory. This is being researched around the world, however is not routinely available as yet. Surgical re-implantation of the removed piece. It is possible to surgically replace the small piece of ovary once the chemotherapy or radiotherapy treatment has been completed. This has been used successfully in a small number of women. What are the chances of my ovaries being damaged by treatment? This is variable and depends on your age and the type of cancer or other medical treatment you require. Return of normal menstrual and reproductive function can vary. Women whose periods stop altogether after cancer treatment have generally had fairly severe damage to the ovary while women whose periods continue normally have had less or even no damage to the ovary. However, even these women may later have an earlier menopause. Does the damage to my oocytes have any other effects on my health? Unfortunately, yes. Your ovaries need the oocytes in order to make the female hormone oestrogen. So, if your oocytes are lost or damaged through medical treatment, your hormone levels will drop considerably and you may experience early menopause. Relief of menopause symptoms, such as hot flushes and night sweats can be obtained by taking hormone replacement therapy. 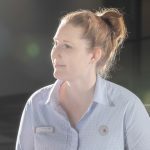 In cases where oestrogen hormone replacement therapy cannot be used, such as breast cancer, a number of other options can be used to relieve the symptoms of a premature menopause. In the longer term, premature menopause may increase the risk of heart disease and the bone disease, osteoporosis. To prevent this, your doctor may advise you to take hormone replacement therapy up to the time that your menopause would have occurred naturally. Is there a risk of transmitting cancer cells if surgical re-implantation is carried out? This may be an unfortunate possibility. Previous work in mice demonstrated that some forms of blood-borne cancer could come back as a result of surgical re-implantation of a piece of ovarian tissue. Surgical re-implantation of ovarian tissue would not be recommended in a woman with a blood-borne cancer (e.g. lymphoma or leukaemia) unless this risk could be removed. The situation for a solid cancer in another part of the body (e.g. breast cancer) remains unclear. It may be possible in the future to use genetic tests to screen ovarian tissues for cancer cells prior to replacement of the biopsy. How long can the ovarian tissue be kept in storage? The ovarian tissue can be stored for as long as you need. Unfortunately, tissue can be damaged by the freezing and by the thawing processes. However, the risk of such damage is not increased by the length of time spent in frozen storage. So, the tissue can be safely left for years if necessary. In addition, we know that children who are born from embryos that have been frozen appear to have a normal development in later life. During the difficult stage of an early cancer diagnosis there is a lot of information to take in and treatment options to consider. 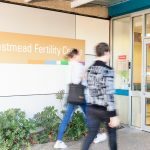 Our team at Westmead Fertility Centre are experienced at providing fertility preservation for female cancer patients and here to assist if you need us.